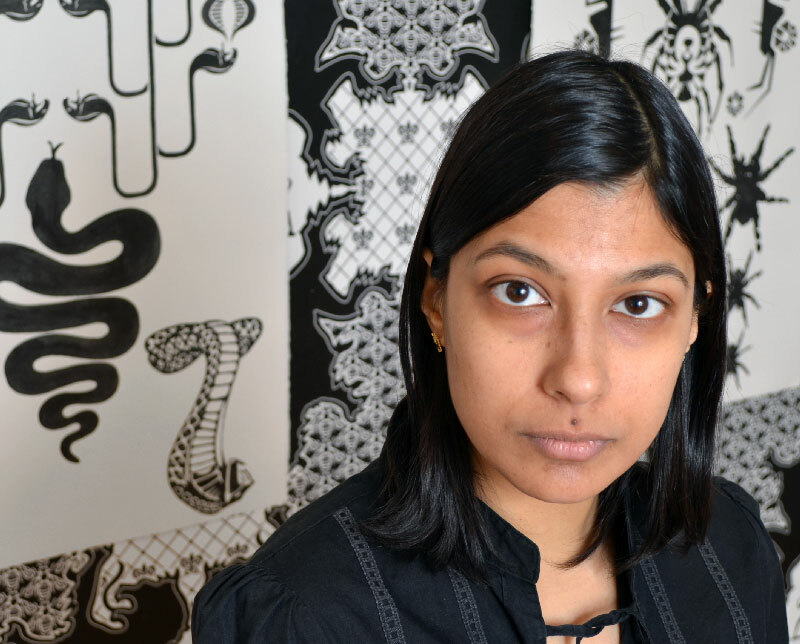 Jain’s work has been exhibited both nationally and internationally. In the last few years, she has had solo projects at Hallwalls Contemporary Art Center, Buffalo, NY (2018); Lakeeren Gallery in Mumbai, India (2012); Station Independent Projects, Lower East Side, NY (2013); and Smack Mellon and BRIC House in Brooklyn, NY (2014). My work recontextualizes the rich visual symbolic language surrounding us to comment on capitalism, globalization and consumerism. I often use labor-intensive and handworked techniques to contrast with the clean aesthetic and design of corporate brands and national flags. Some questions that I am addressing include the voice of the individual in contemporary society, the relationship of the spiritual to the commercial, and the larger political and economic power structures at play. Arrow In, play by Nina Morrison, Dixon Place, 2012. Girl Adventure: Parts 1-4, play by Nina Morrison, Dixon Place, 2011. Market, (representing ABC No Rio), Living as Form, Creative Time, 2011. In Peace and War: 3 Teens Kill 4, Theatre 80 St. Marks, 2011. Book of Stamps, ed. by Sina Najafi, Cabinet, 2008. Against Competition/Towards Mutual Aid, ABC No Rio in Exile at Flux Factory, Queens, NY. Ghost Modernism, Quartair, the Hague, the Netherlands. WW$: Money Money Money, _gaia. ABC No Rio, NY; Lex Leonard Gallery, Jersey City, NJ. Map Show, Rockland Center for the Arts, West Nyack, NY. Ides of March, ABC No Rio, NY. Founding Fathers, ABC No Rio, NY. 4th Independents' Biennial, Charas/El Bohio, NY. Foran, Jack. Artisanal Capitalism, The Public, March 28, 2018. Young, Stephanie. Vandana Jain Masks a Sinister Intention Behind Beautiful Optical Murals, Beautiful Decay, January 15, 2015. Pangburn, DJ. Dazzle Camouflage Hides Logos in Optical Illusions, Creators Project, Sept 25, 2014. Howard, Christopher. Shorthand of Luxury, Artforum.com, January, 2013. Laluyan, Oscar. Symbols of Personal Luxury, Artefuse.com, Jan 14, 2013. Painting by Logo, Mumbai Boss, Sept 13, 2012. Cotter, Holland. Her Stories, The New York Times, August 16, 2012. Shah, Pooja. Vandana Jain, Kyoorius, pp. 90-91, Fall 2011. Hilgenberg, Holly. Home is Where the Art Is, Twin Cities Runoff, Dec 11, 2010. Roalf, Peggy. Stitched Stories at Center for Book Arts, Design Arts Daily, July 8, 2009. Manmadhan, Prema. Caught Between Two Cultures, The Hindu, April 27, 2009. Genocchio, Benjamin. Maps of All Sorts Charting Mind and Space, The New York Times, March 16, 2008. Gardner, James. A Blast from the Past, The New York Sun, March 27, 2008. Mils, Michael. East Wind a Blowin’, Broward Palm Beach New Times, April 3, 2008. McAdams, Shane. An Exhibition worth Unwrapping, Downtown Express, Vol 19, issue 33. Genocchio, Benjamin. Coloring a Tropical Paradise,” The New York Times, December 3, 2006. McAdams, Shane. ArtSeen: Well Read, Brooklyn Rail, April 2006. Davis, Ben. Sign of the Times, arnet.com, August 17, 2005. Kennedy, Randy. Flash, Dash and Now Art, The New York Times, June 17, 2005, pE33. Scott, Andrea K. Brave New World, Time Out New York, March 17-23, 2005, p88. Cotter, Holland. Taking a Magical Flight Through Modern India, The New York Times, March 4, 2005, pE33. Herzberg, Julia P. AIM24, ArtNexus No. 54, September–December 2004, pp 176-177. Genocchio, Benjamin. A Chance to Fill Up on Visual Treats, The New York Times, April 25, 2004. Stillman, Nick. Introducing..., NYFA Current, May 5, 2004. Cotter, Holland. Where Witty Meets Gritty, The New York Times, Nov 15, 2002, pE31. Smith, Roberta. The New York Times, September 13, 1996, pC30.